Ibiza is a paradise of excellent music and great people. It has the best beaches in the Mediterranean, which makes it no easy task when choosing a spot to make the most of those hot summer nights. 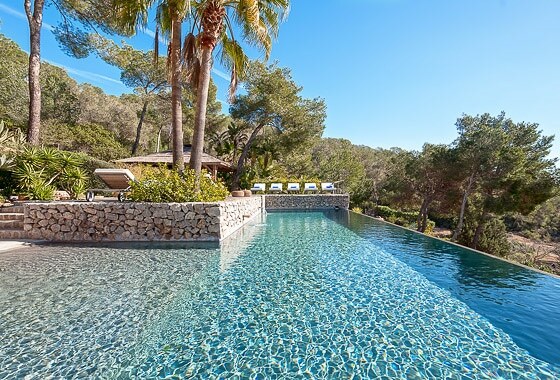 Wherever you go, you can’t miss Cala Compte, renowned for its stunning sunsets, or las Salinas, another one of the island’s top picks for celebrities who visit Cala Bassa, Cala Salda, Benirras or Aigues Blanques. Lose yourself in the winding back streets of D’alt Vila (a UNESCO World Heritage site) and scale its highest peak where you can enjoy breathtaking panoramic views of the city and its port. Experience Ibiza’s fascinating hippy heritage for yourself in one of its markets. One of the best is the Las Dalias Market, where there’s a huge variety of unique creations crafted by artists and artisans on offer. Ibiza is one of those places where life is lived more intensely after dark. If you’re looking for great music and celebrity guests, don’t miss Pachá, the island’s original and most iconic club set in an ancient converted farmhouse. Indulge in the islands finest food in stylish venues such as Cala Bassa Beach Club, Bullir de Peix or El Bigotes. If you’re after the island’s trendiest restaurants, don’t miss Yemenja, El Blue Marlin, La Escollera or Chiringuito de España Cavallet. Don’t forget Sa Punta Restaurant, located in the furthest point from Talamanca Bay. A unique restaurant where locals, influencers and the international jet-set rendezvous for fabulous food and chilled out vibes. Another unmissable dining spot is La Paloma, set in an old farmhouse surrounded by orange and lemon trees, serving a cultural fusion of Italian and Israeli flavours. End the night with good music, good people and good vibes on Experimental Beach. Lose yourself in the glamorous playground that is Ibiza, one of the most magical islands in the world.